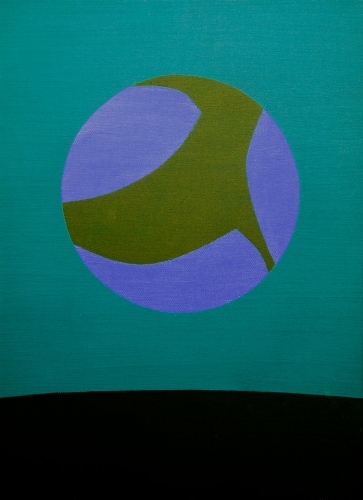 Helen Lundeberg was born in Chicago, Illinois on June 24, 1908 to second-generation Swedish Lutheran parents. At the age of four, her family moved to Pasadena, California with hopes that a more decent climate would improve her mother’s health. Her father soon began to work for a real state and stock brokerage company. Although her parents were not very religious, Lundeberg regularly attended Sunday school and church, primarily for the music. By the age of 12, Lundeberg spent a substantial amount of time reading novels and travel books, which sparked her imagination and curiosity. At the age of 16, Lundeberg became interested in art but did not think about pursuing it as a career. Instead, she focused her attention on becoming a writer. In fact, Lundeberg was a bright student and was chosen to participate in a study for “Gifted Children,” conducted by Stanford University in 1921. As time progressed, her mother’s health nevertheless worsened. After graduating from Pasadena High School in 1925, she stayed home to take care of her mother until the fall of 1927. That same fall, she enrolled at Pasadena City College where she majored in English and minored in Science. In 1930, she graduated from junior college with the intention of continuing her education. However, with the onset of the Great Depression, Lundeberg did not have the financial means to go on with her education. Lundeberg’s life soon took an unexpected turn when a friend of her mother noticed her artistic skills and offered to pay three months of art classes. Shortly after, Lundeberg enrolled at Stickney Memorial School of Art in Pasadena that year. She studied under Lawrence Murphy (1872-1947) in a Bridgman-style figure construction and composition class, which was then taken over by Lorser Feitelson (1898-1978) in the summer. 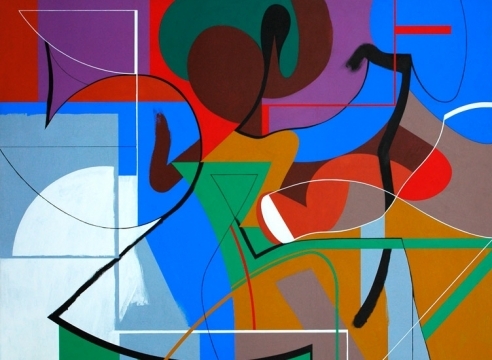 Once Feitelson replaced Murphy, he changed the structure of the class to a discussion and graphic analysis of the compositional principles of Renaissance masters, which taught Lundeberg how to distinguish art from illustration. Feitelson was an influential teacher for Lundeberg. Afterward, they developed a close relationship and eventually married. Upon witnessing Lundeberg’s artistic potential, Feitelson advised her to pursue a career as an artist. At the age of 23, Lundeberg began to view art as a serious profession. 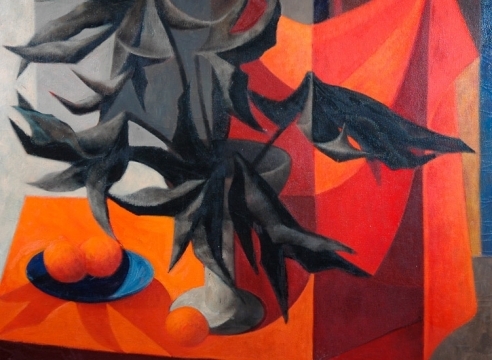 In 1931, with Feitelson’s encouragement, Lundeberg exhibited her first work of art titled, Apple Harvest, at the “Sixth Annual Exhibition of Southern California Art” at the Fine Arts Gallery of San Diego. Two years later, she was the first to have a one-person exhibition at Stanley Rose Gallery in Hollywood. From this point forward, her work was exhibited in numerous shows throughout Southern California. While seeking to create art that would use symbolic subjects to present a deeper rational meaning, Lundeberg and Feitelson joined forces to initiate a new art movement which would later be known as Post-Surrealism. In 1934, Lundeberg wrote and published the manifesto for the new art movement titled “New Classicism,” which was also joined by other artists such as Grace Clements (1905-1969). The following year, Lundeberg exhibited one of her earliest Post-Surrealist works, Double Portrait of the Artist in Time (1935) at the Stanley Rose Gallery in Hollywood which received praise as one of her greatest achievements. Shortly after, Lundeberg took part in several Post-Surrealist group exhibitions and gained national recognition. From 1933 to 1941, Lundeberg was commissioned to produce easel paintings, lithographs, and murals for the Federal Public Works Art Project (PWAP). After executing two murals for the Los Angeles County Hall of Records in 1936, she produces four lithographs the following year. 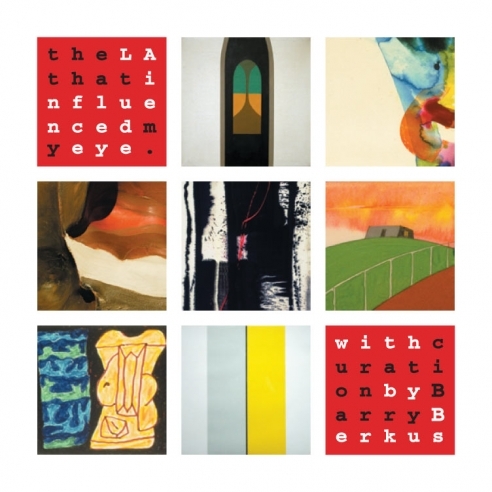 During this period, Lundeberg moves to Los Angeles to be closer to the PWAP offices. By the age of 41, Lundeberg began to receive numerous awards that confirmed her outstanding talent. In 1949, she received the first purchase prize award for The Clouds in the “Ninth Invitational Purchase Prize Art Exhibition” at the Chaffey Community Art Association in California. A year later, she received a $1,000 First Purchase Award for Spring in the “1950 Annual Exhibition: Artists of Los Angeles and Vicinity” at the Los Angeles County Museum. In 1962, Lundeberg participated in a major East Coast exhibition titled, “Geometric Abstraction in America” at the Whitney Museum of American Art in New York that once again validated her status as a major American artist. Although she was gaining much respect in her career, her private life soon took an unexpected turn when Lorser Feitelson died of heart failure in 1978. Despite her sudden loss, Lundeberg’s career continued to gain impetus. In 1981, she was honored with an award for outstanding achievement in the visual arts by the College Arts Association in San Francisco. Moreover, she was given the Woman of the Year Award by the Palm Springs Desert Museum which proclaimed her significant contribution to the art world. Her work remained to be praised and exhibited even after her death on April 19, 1999 in Los Angeles. As one of the founders of the American Post-Surrealist movement, Helen Lundeberg’s work is widely identified as poetic and lyrical. With a career in art that lasted more than five decades, her work transformed progressively over the years from objective subjects to more illusionistic, abstract forms of representation. Although she only obtained two years of formal art training, she managed to establish a reputation as a major American Artist by the time she was 30. Her early work in the 1930s was greatly influenced by her teacher at the time, Lorser Feitelson, who had closely studied the methods of the Renaissance masters. As a result, the structure in Lundeberg’s work was carefully thought-out with the same technique that the old masters had employed. In fact, it was her skill in organizing the objects in her paintings without any awkward placement that immediately brought attention to her work. For instance, as The New York Times critic, Edward Alden Jewell once stated, “she handled her brush with cosmic authority” (Moran 24). From her earlier works, Lundeberg used a palette of cool subtle colors that not only instilled a sense of motionless and tranquility, but would later become a characteristic of her work. Lundeberg’s earliest works were also precursors to the new art movement termed “Post-Surrealism” that she and Feitelson would come to initiate. Lundeberg and Feitelson had come to appreciate the “insistence on strange encounters between objects, the clarity with which chosen fragments of reality are represented, and the depiction of space” that Giorgio de Chirico, a European Surrealist, employed in his work (Anderson 183). Yet, they rejected the incongruity of narratives in Surrealist works. Instead, Lundeberg and Feitelson sought for a more classical approach to form and content that would make the viewer see a rational meaning within the work. In other words, they were interested in the symbolic aspects of Surrealism but disliked the unconscious and dreamlike aspects of the work that had no rational meaning. In 1934, Lundeberg set out to write the manifesto for this new art movement which they initially termed, “New Classicism” but would later be called “Post-Surrealism.” Furthermore, along with other artists such as Grace Clements, Philip Guston, Lucien Labaudt, and Knud Merrild, Lundeberg was part of a new movement that was America’s first collaborative response to European Surrealism (Karlstrom 28-29). Moreover, her work under the Post-Surrealism movement consisted of pictorial subjects that were strategically placed and that when connected, formed a symbolic theme. For example, in Plant and Animal Analogies (1934-35), Lundeberg depicts a female torso, a womb in cross-section, and a fetal brain, and blood vessels that symbolically allude to the cycle of life. One of her most celebrated oil paintings is Double Portrait of the Artist in Time (1935), which portrays the artist as a child in the foreground and as an adult in a portrait on the wall. Nonetheless, this painting is one example of Lundeberg’s refined brushstrokes that she employed in all of her works. Through her soft mechanical brushstrokes, she forces the viewer to focus on the content of the painting rather than on the brushwork (Moran). In addition to her involvement in the Post-Surrealist art movement, Lundeberg produced several lithographs, easel paintings, and murals under the PWAP from 1936 to 1942. She used several mediums to create the murals including oil vignette and petrachrome. In the 1940s, her work turned a slightly different direction from the systematic aspects of her earlier works. Lundeberg began to move towards broader, reminiscent themes and was more concerned with rendering illusionistic space. As she stated, “Since about 1942 my work has been concerned, in varying modes of pictorial structure and various degrees of representation and abstraction, with the effort to embody, and to evoke, states of mind, moods, and emotions” (Moran 26). Then during the 1950s, Lundeberg took it a step further and began to paint abstract forms that were non-objective. Lundeberg found herself more interested in the complexities of space rather than forms. As a result, her paintings during this period consisted of simple geometric forms with minimal color, in order to avoid distractions from the feeling of space that was Lundeberg’s primary aim. The following decade, Lundeberg continued to use non-representational forms that were somewhat recognizable, yet were imaginary. Her work during this time consisted of 2-dimensional architectural forms that were set against illusionist landscapes. Most of the architectural forms in these paintings were arches but were not rendered from observation. 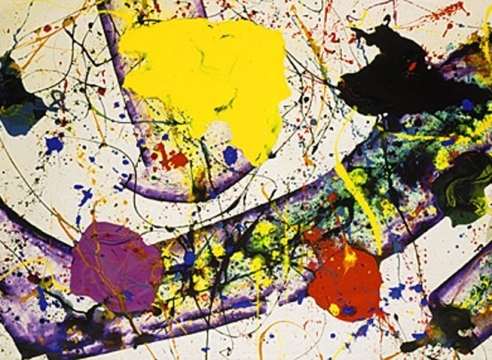 In addition, she began to employ greater contrasts in color, mostly dark tones set next to the primed canvas. Moreover, the shift in colors was also due to her change in medium. Starting in 1965, Lundeberg began to use liquid acrylic paint that allowed her to depict “brighter and fresher colors” (Kahan 214). During this time, she also began to use masking tape as her drawing tool instead of charcoal or pencil since it allowed her to achieve a clean finish without any marks. Nevertheless, during the 1970s, Lundeberg replaced the architectural forms in her work with pictorial objects. In an attempt to instill the “mood entity” which was part of the surrealist agenda, she painted small still-life landscapes that depicted simple objects such as fruits and shells in vast landscapes. In fact, her interest in illusionistic landscapes continued through the end of her career, as she once stated, “Now, in the 1980s, I find myself turning more and more to landscape, but my landscapes, as always, are invented, as are the architectural fragments that sometimes accompany them or frame them…” (Hopkins 95). Joseph H. Hirshhorn Museum, Washington, D.C.
1. Anderson, S. M. (1996). “Journey into the Sun: California Artists and Surrealism.” In Karlstrom, P. J. (Ed. 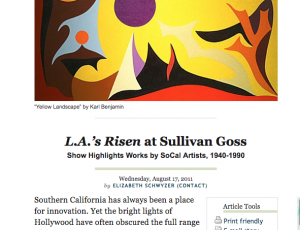 ), On the Edge of America: California Modernist Art 1900-1950(pp. 181-187). Berkeley, CA: University of California Press. 2. Butterfield, J. (1983). Helen Lundeberg: a poet among Painters. [exhibition catalog] Place: Palm Springs Desert Museum in Palm Springs, CA. 3. Ehrlich, S. (1995). Pacific Dreams: Currents of Surrealism and Fantasy in California Art 1934-1957. Los Angeles: UCLA at the Armand Hammer Museum of Art and Cultural Center. 4. Hopkins, H.T. (1990). California Painters: New Work. San Francisco: Chronicle Books. 5. Kahan, M.D. (1979). Art Inc.: American Paintings from Corporate Collections. Alabama: Montgomery Museum of Fine Arts and Brandywine Press. 6. Karlstrom, P.J. (1990). “Modernism in Southern California, 1920-1956: Reflections on the Art and the Times.” In Karlstrom, P.J., & Ehrlich, S. (Eds. ), Turning the Tide: Early Los Angeles Modernists 1920-1956 [exhibition catalog] (pp. 13-42). Santa Barbara: Santa Barbara Museum of Art in Santa Barbara, CA. 7. Moran, D.D. (2004). Helen Lundeberg and the Illusionary Landscape, Five Decades of Painting. [exhibition catalog] Hollywood: Louis Stern Fine Arts in Hollywood, CA.